On January 12 at Haebaru Cultural Center in Haebaru Town, Suzuyo Takazato of Okinawa Women Act Against Military Violence talked about how sexual violence starting with the Battle of Okinawa continues today. Takazato pointed out that there were 145 comfort stations in Okinawa that the Japanese army set up. She said, “It was ‘a new war’ called sexual attacks” of the Japanese army and U.S. army. 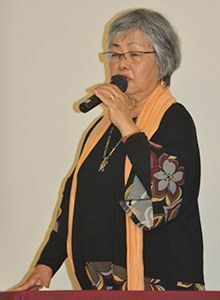 Sexual violence by the U.S. military began immediately after they landed, and “All residents including men and children were frightened by the violence.” Takazato also scoured records including local municipalities’ histories and newspaper articles, collecting testimonies from victims and sharing them with her audience. She explained that the residents who witnessed sexual assaults also suffered, because they were unable to save those being assaulted. In regard to the background of continued sexual violence related to the US military bases in Okinawa, Takazato pointed out that prejudice remains deeply rooted in both the U.S. military and in Japanese society. “We must listen to the voices of the victims. We must reveal past sexual violence.” In addition, she appealed for revision of the Japan-U.S. Status of Forces Agreement and stressed that she would not allow the construction of a new base in Henoko, Nago City. Akiko Mori of Doshisha University’s Amami-Okinawa-Ryukyu Research Center of also gave a lecture.